MSNBC TV hosts Chris Matthews, Lawrence O’Donnell, and Rachel Maddow have made early forecasts of the winner of the 2012 presidential election. With the exception of Matthews, the talk show hosts are overconfident of Barack Obama’s prospects for reelection and all three are underestimating Michele Bachmann’s potential for success. BEVERLY HILLS, Calif.— When three MSNBC hosts forecast the winner of next year’s presidential race, their choice isn’t surprising, considering the network’s liberal tilt. But their respective certainty wasn’t uniform when asked that question at an appearance before reporters on Tuesday at a meeting of the Television Critics Association. Lawrence O’Donnell, host of “The Last Word,” flatly predicted the re-election of President Barack Obama. Rachel Maddow also named Obama, attributing her pick to a thus-far weak Republican field. But “Hardball” host Chris Matthews waffled, saying Obama’s fate will rest largely on the economy as well as his GOP rival. 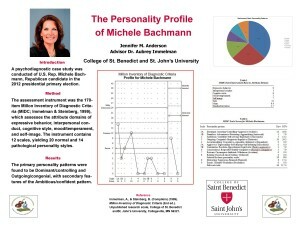 Empirical analysis indicates that Michele Bachmann has a congenial competitor (“happy warrior”) personality type, with a mixed Dominant/controlling and Outgoing/congenial primary personality pattern and secondary features of the Ambitious/confident personality style. The Personal Electability Index (PEI) has accurately predicted the outcome of every presidential election since 1996 prior to Super Tuesday. What Are the Chances for Republicans? How would the strength of the economy next year affect each candidate’s chances of defeating President Barack Obama? Nate Silver models the likelihood of each candidate winning the popular vote based on 2012 G.D.P. growth, President Obama’s current approval rating and the ideology of the candidate. Use the slider to see how changes in G.D.P. affect the model. One year ago today, I endorsed former Republican Tom Horner as the best choice for Minnesota in the Independence Party gubernatorial primary. Two years ago today, on August 2, 2009, I reported that the U.S. Department of Defense announced that the Armed Forces Institute of Pathology had positively identified remains recovered in Iraq as those of Navy Captain Michael Scott Speicher, whose F/A-18 Hornet was shot down in a combat mission over Iraq on January 17, 1991 in the first hours of Operation Desert Storm. Three years ago today, on August 2, 2008 — the 19th day of my 2008 campaign against incumbent U.S. Rep. Michele Bachmann for the Republican nomination in Minnesota’s 6th Congressional District — I walked in the Albany Heritage Day Parade.